S2R | What Does S2R Mean? 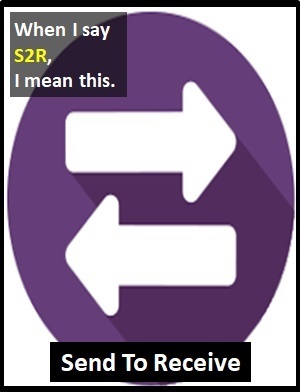 S2R means "Send To Receive". S2R is used in text-based chat as a request to exchange pictures. S2R is the online equivalent of saying "I'll show you mine, if you show me yours". "Send To Receive" is also abbreviated as STR. S2R: I'll show you mine if you show me yours. Terri: I would love to know what you look like. Anita: If I send you a photo, will you send me one? Sam: S2R? Of course, no problem. S2R is defined as a cyber term because some of its characters are used as substitutes for letters. Cyber terms differ from icons because they are not pictorial representations. Neither the abbreviation S2R nor the phrase "Send To Receive" existed before the digital era.